Brett Kirk (left) and Paul Roos (right) soak up the emotion of their final SCG game. To be able to take my young family and walk around the SCG after the game was just amazing. If I could have, I would have jumped the fence and hugged every person in there to say thank you. In a series new to 2019, we revisit moments in history involving the Sydney Swans’ round-by-round opposition. History, nostalgia and memories form a special part of what makes Australian rules football great, and we hope the Footy Flashbacks series reignites some of your fondest Swans moments. In the first edition, we wind back the clock to the day Paul Roos and Brett Kirk farewelled the SCG, a frozen moment in time that saw the Swans defeat the Western Bulldogs in Round 21, 2010. 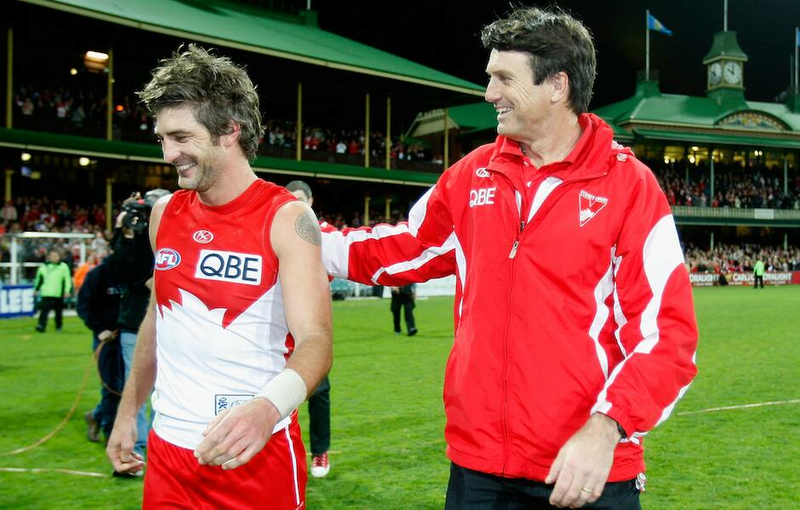 Over a glorified chapter in Sydney Swans history spanning more than a decade, Paul Roos coached 72 games for the return of 53 wins at the SCG, and Brett Kirk made 91 appearances and recorded 64 victories. And on August 21, 2010 – in a 44-point win over the Western Bulldogs in Round 21 – coach Roos and co-captain Kirk drew curtains on their time at the hallowed home of the Swans. Coincidentally, Roos and Kirk would then lead Sydney for the final time in the Swans’ semi-final clash with the Bulldogs at the MCG less than a month later, but not before Kirk had farewelled the red and white faithful at the SCG with the man adored as 'Roosy'. For the love of the red and white. “The SCG was my favourite ground to play at,” Kirk told Swans Media. “The crowd’s so close to the action and the smaller ground makes for a more contested game, which I enjoyed. To be able to run out on game day and train at a venue like the SCG with the team you grew up loving was very special. It’s what you dream about as a kid. “'Roosy' was here as a player when I arrived at the club, but being a fringe or top-up player I didn’t have much of a relationship with him early. And then even as an assistant coach in 2001, I knew him but not that well. But once I was given an opportunity as a leader ahead of season 2003, our relationship developed into a really strong connection where we both challenged each other to get better. We didn’t always agree, but the special thing about our bond was that we always knew our words and actions were intended for the betterment of the club. Kirk farewelling the SCG with his wife Hayley and four kids. Kirk made his AFL debut as Sydney defeated North Melbourne at the SCG in Round 19, 1999. After amassing 87 games in red and white between 1995 and 1998, Roos – who made 356 career appearances for Fitzroy and Sydney – returned to the Swans as an assistant coach for season 2001. He then commenced his reign as interim coach of the Swans at the SCG in Round 13, 2002 as Sydney overcame Fremantle. And after guiding the Swans to six wins from 10 games over the second half of the 2002 campaign, Roos was appointed as Rodney Eade’s successor on an initial deal totalling three years. As the Swans took on the Bulldogs on the day Roos and Kirk waved goodbye to a 36,554-strong SCG crowd, Kirk tallied 13 possessions and two goals on his way to collecting one Brownlow vote. And the 241-game Swans champion, who rounded out his career with a 200th consecutive appearance, says his second goal of the game made for a moment he’ll never forget. Jude (left) and Craig Bolton (right) chair Kirk off the ground. “Late in the game I was playing forward and playing on Robert Murphy, who was one of the great half-back gentlemen to have played the game,” Kirk said. “I led up and took a mark on him. I thought it was roughly 50 metres out, so it was probably out of my depth for a set shot on goal. But the footy gods were on my side that night, and the footy just wobbled its way through. Then the exhilaration of the players getting around me – it was like I was dancing on a cloud. Kirk (right) celebrates with Jarrad McVeigh (left) after booting his second goal of the game. Almost nine years on, Kirk is passing on his wealth of knowledge to the Swans of today, with the dual Bob Skilton Medallist working as a midfield coach alongside Dean Cox. Kirk addressing the Sydney charges as an assistant coach. Players like Josh Kennedy, Luke Parker, Isaac Heeney, Callum Mills, George Hewett and Oliver Florent will be tasked with patrolling the centre bounce in season 2019, and Kirk says it means a lot to him to be shining a light for those following in his footsteps. “I get a lot of enjoyment out of something that I think is very special. The club has a long history. There are so many people that have gone before, and I’m just trying to help guide the next generation of players coming through,” Kirk said.